Monday 10:30 a.m. - 12 a.m.
Tuesday 10:30 a.m. - 12 a.m.
Wednesday 10:30 a.m. - 12 a.m.
Thursday 10:30 a.m. - 12 a.m.
Sunday 10:30 a.m. - 1 a.m. Enjoy a wide variety of pizzas, sandwiches, pastas, chicken, breads, chips, drinks and desserts. Build-Your-Own pizza with over 25 toppings to choose from or, choose from the most popular selections. Visit the Domino's Pizza Website for the menu and to order online. 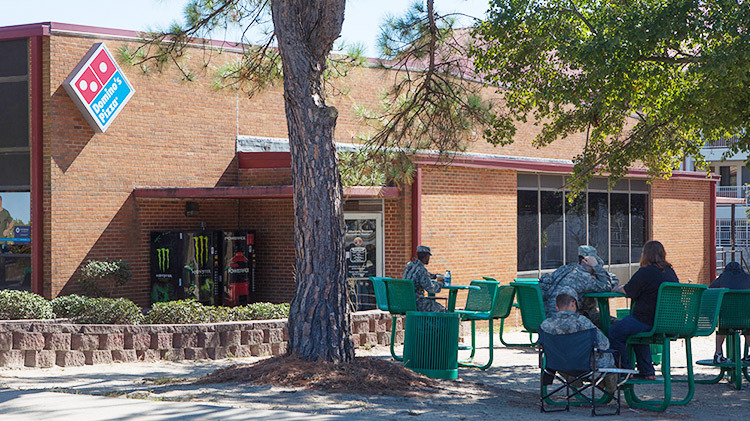 *May not apply to all areas of Fort Gordon including Tactical Advantage Sportsman's Complex and Leitner Lake area. Located in the Alternate Escapes Recreation Center.